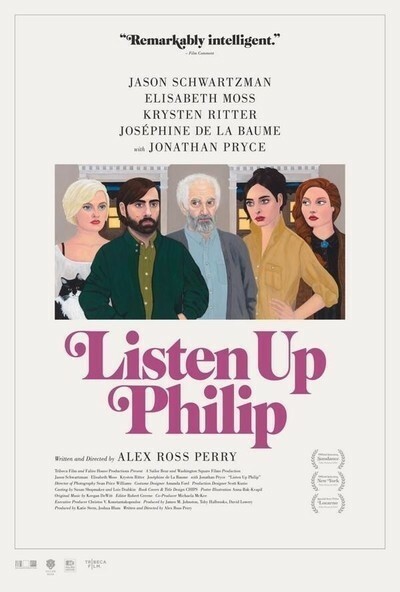 For one of the things that make “Listen Up Philip” so distinctive is the relentless unpleasantness of its lead character, young novelist Philip Lewis Friedman, played here with knuckle-bitten commitment by Jason Schwartzman. In the movie’s opening scene, Philip meets with an ex-girlfriend for lunch; he intends to give her the galleys of his latest novel, but when she shows up late, he browbeats her within an inch of her life. Having decided that abusiveness is personally liberating, he arranges a meet with an old college chum, who he abrasively condemns as a sellout. “What about our declaration of principles,” he whines, waving some paper in the guy’s face. “Remember this?” The punchline to the scene is that Philip’s erstwhile friend is in a wheelchair. Put another human being in front of Philip, and he’ll figure out a way to irritate him or her. Is he horrible, or just befuddled? “Things I’ve coveted for years are mine now and I feel miserable,” he says, sincerely; then he shoots the sentiments down: “That’s so cliché.” He purposefully alienates his long-time girlfriend (Elizabeth Moss) but comes on all attentive and furrow-browed to older novelist Ike Zimmerman (Jonathan Pryce), who’s cut from the same misanthropist cloth as his possible acolyte. (And whose book jackets have the same typeface as that of Philip Roth’s classic “Portnoy’s Complaint;” Roth is an acknowledged influence on Perry, although Roth’s conception of humanity looks as cuddly as William Saroyan’s when put up against Perry’s perspective.) But Philip has a few things to teach Ike about forcibly keeping the world at bay, despite the best efforts of Ike’s daughter Melanie (Kristen Ritter) to put both men in their place. “Listen Up Philip” is not quite so plot-oriented as I’m making it sound. The movie has a peculiar structure, in that it follows the narratives of individual characters almost willy-nilly, delivering wry, upsetting mini-narratives of the futility of all human endeavor. These are all peppered with discomfiting insights and dialogue zingers, and Perry’s eye for comic detail in all the right places pays off nifty dividends, as in Zimmerman’s very funny vanity license plate. The terrific cast all delves into the material full-bore, which contributes to its peculiar resonance. Perry may hate everyone and everything, but in making a show of it, he’s thoroughly entertaining. One hopes he works out his anger issues some time for his own sake, but I’m actually worried it would have a deleterious effect on his actual art. Which could still use some refining: the movie’s narration, handsomely read by Eric Bogosian, doesn’t really achieve the formal ends that its faux-stilted stylings are aiming for, and in fact it could have used some copy-editing. I’m available, Alex!